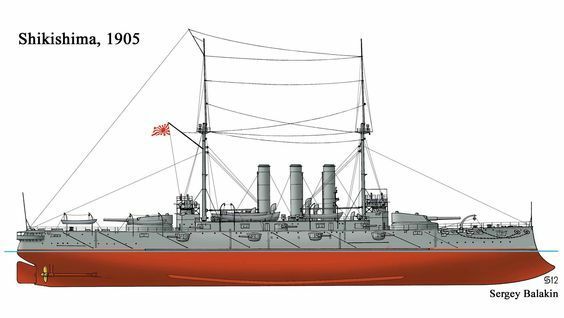 The Shikishima and Hatsuse were built in two British shipyards on plans derived from the Majestic. 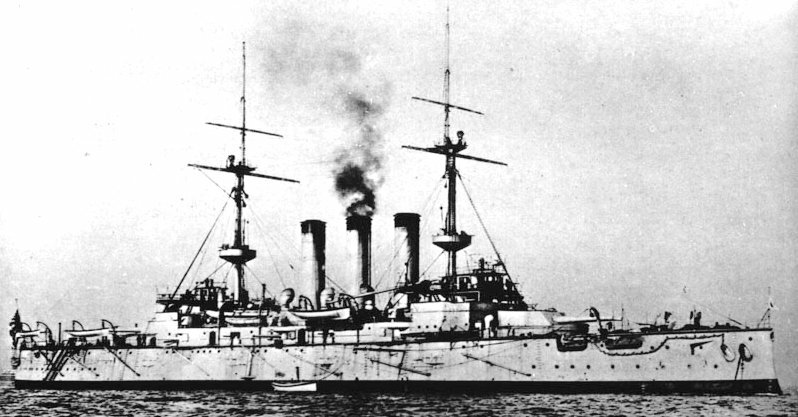 They were more heavy versions of the previous Fuji and differed externally by their three funnels. 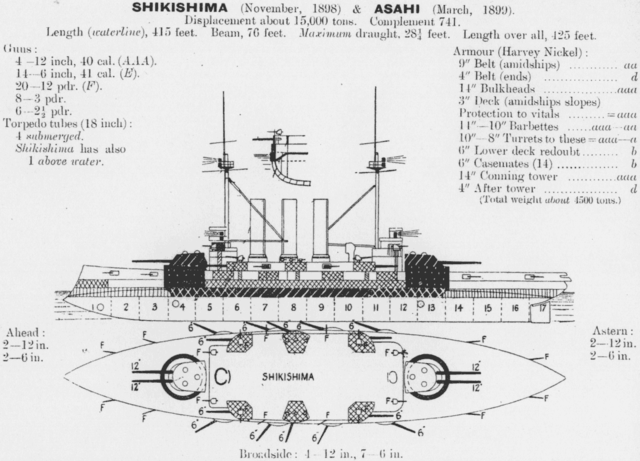 The subsequent Asahi and Mikasa derived from it so closely that they are sometimes placed in one and the same class. Like the Fuji class, the Japanese general staff based its requirements on reports from the First Sino-Japanese War. They were convinced of the weaknesses in the Jeune Ecole (Young school) naval philosophy, and embarked on an ambitious program of modernization and construction this time entirely modelled on the Royal Navy. When the Fuji-class battleships were ordered, Japan still lacked capabilities and skilled labor to built its own battleships. The new Shikishima class was a modified and improved version of the Majestic-class battleships, also ordered in UK. They had the same armament and similar machinery. 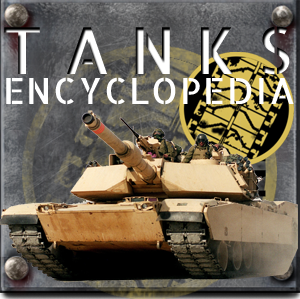 However similarities stopped there, as these ships also had an improved armor, and a double bottom with no less than 261 watertight compartments. 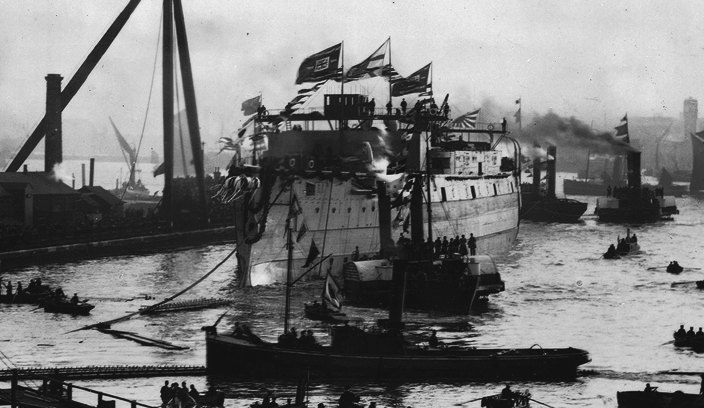 Raw power was provided by two Humphrys Tennant vertical triple-expansion steam engines, rated at 14,500 indicated horsepower (10,800 kW), for 18 knots top speed. 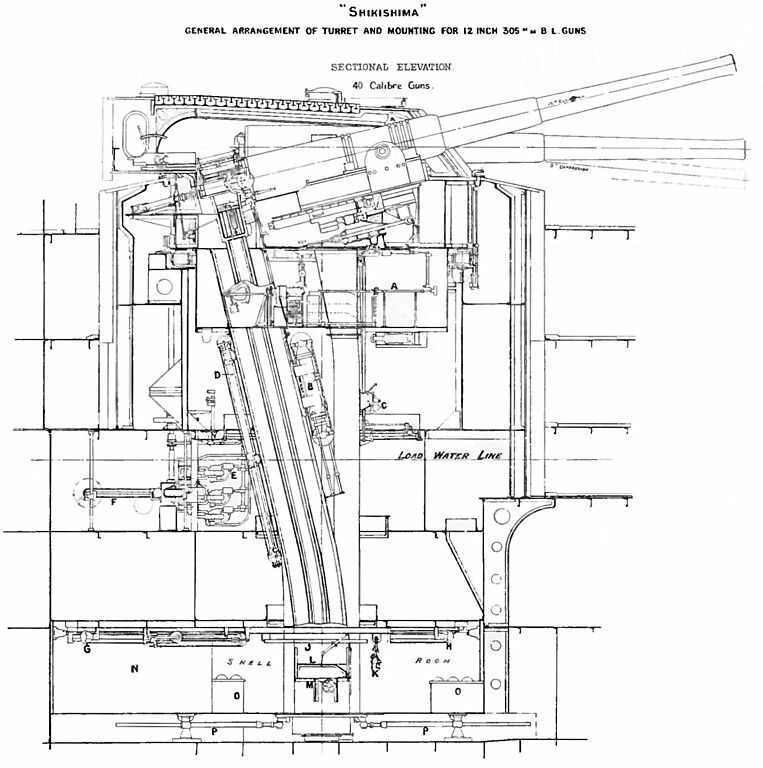 The four 12 in main gun, fired 850-pound (386 kg) projectiles at a muzzle velocity of 2,400 ft/s (730 m/s). The secondary 40-calibre Type 41 6-in QF guns mounted in casemates 100-pound (45 kg) shells at a muzzle velocity of 2,300 ft/s (700 m/s). The ships could fend off TBs attacks twenty QF 12-pounder 12 cwt (“Cwt” is the abbreviation for hundredweight) and four 2.5-pounder Hotchkiss guns. 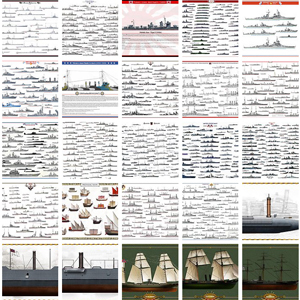 When the Russo-Japanese War broke out, both battleships served with the 1st Division of the 1st Fleet. 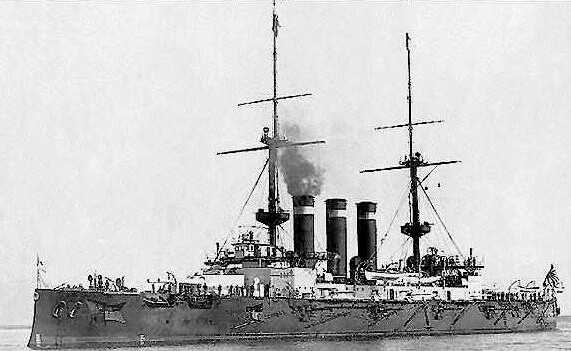 Both fought in the Battle of Port Arthur on 9 February 1904, under Admiral Tōgō Heihachirō. He chose to attack the Russian coastal defences with the main battery and engage simultaneously Russian ships with the secondary artillery. 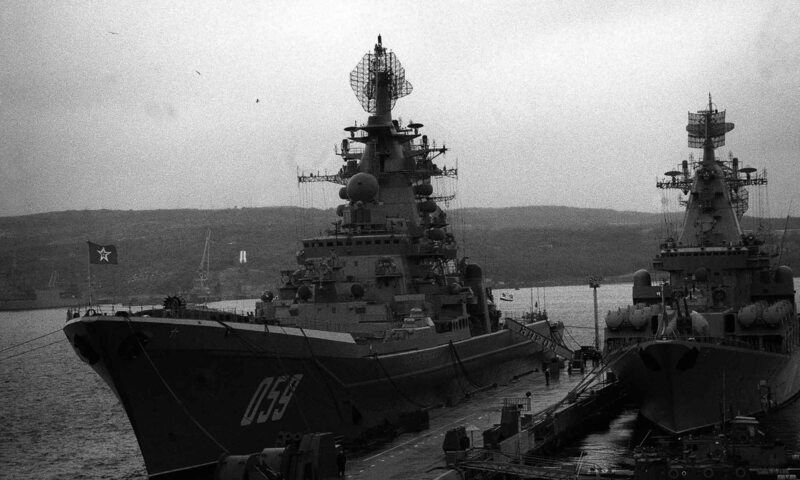 But it proved a bad move, inflicting little damage whereas the Russian ships were able to replicate with full force. “Hatsuse” was a revered Hase-dera temple, famous in Japan for its maple trees. It was completed on 18 January 1901 and represented locally the Meiji Emperor at Queen Victoria’s funeral. 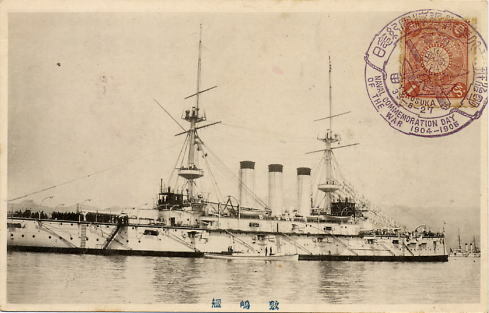 After sailing home and after years of exercizes and intensive training, she was committed in the Russo-Japanese War, under order of Captain Yu Nakao, part of the 1st Division, 1st Fleet. In the Battle of Port Arthur Hatsuse was hit twice during the battle, losing seven crewmen killed and 17 wounded. 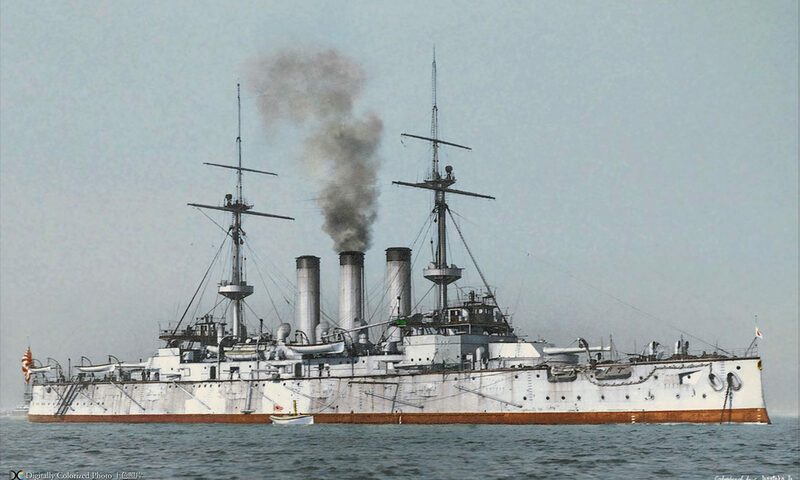 On 14 May 1904, under orders of Admiral Nashiba she sailed to relieve the Japanese blockading force off Port Arthur, but on the following morning, encountered a minefield laid by the Russian minelayer Amur. Hatsuse struck one mine, disabling her steering at 10:50 a.m. Yashima struck also a mine when trying to assist her. Two hour slater, Hatsuse drifting helplessely hit another mine under one of her magazines, immediately blowing the ship apart, and killing 496 in the process. The ship capsized and sank too fast to escape her. Her hulk can be still isited today at 38°37′N 121°20′E. While Tatsuta and Kasagi saved the Admiral, Captain Nakao and 334 other officers and enlisted men, but Yashima foundered about eight hours later, all her crew escaped safe. “Shikishima” is a poetical name for Japan. 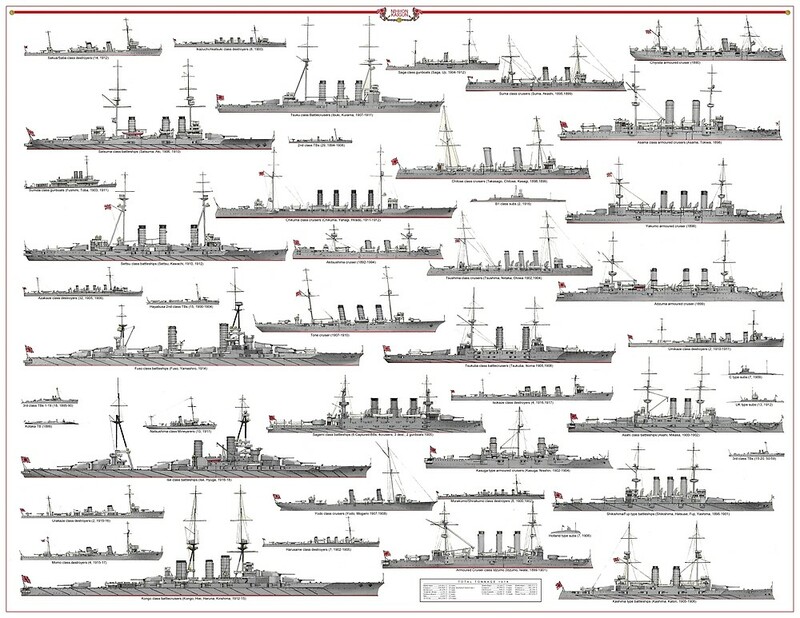 Part of the 10 Year Naval Expansion Programme she was completed on 26 January 1900, and sailed for Japan, spending months in exercises, before sailing in operations in the Russo-Japanese war, as part of the 1st division, 1st fleet under command of Captain Izō Teragaki. During the Battle of Port Arthur instead of funding the fleet disorganized and weakened after the destroyers night attack found the Russians ready and on high alert. When engaged with secondary calibers, these ships replicated heavily and Shikishima was hit by one six-inch shell, which wounded 17 crewmen. Later she participated in the action of 13 April which convinced the Russian to lay more minefield. And that was in one of them that Shiskishima just sailed, on 15 May 1904 under Rear Admiral Nashiba Tokioki orders apparetly hitting a mine, but surviving. During the Battle of Tsushima in May 1905, she was hit nine times and the the most serious hit penetrated beneath a six-inch gun while one of her own 12-inch shells detonated in her forward guns. Mikasa and Shikishima however managed to destroy the Battleship Oslyabya which became the first modern battleship sunk entirely by gunfire. in total Shikishima fired 74 12-in shells, 1395 6-in and 1272 12-pdr shells during the battle and a torpedo, badly damaging the Russian armed merchant cruiser Ural. 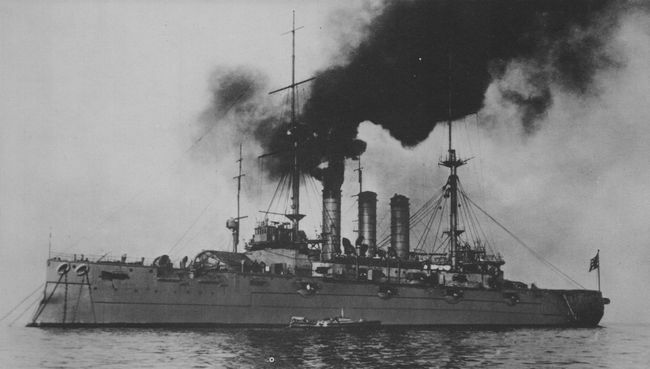 During World War I, Shikishima was based at Sasebo until 1915, then was assigned to the Second, then Fifth Squadrons due to her age for the remainder of the war. Due to the Washington Naval Treaty limitation she was reclassified as a first-class coast defence ship on 1 September 1921, training submarine crews, then as as a transport on 1 April 1923, disarmed, continued to be used as a training hulk for the Sasebo Naval Barracks. She suvived in this role until scrapped in January 1948, always at Sasebo. Shikishima disarmed in the 1920s, notice the high draught due to the removal of the artillery, magazines, and some armour. She survived until 1948. This ship was built at John Brown shipyards in Britain. 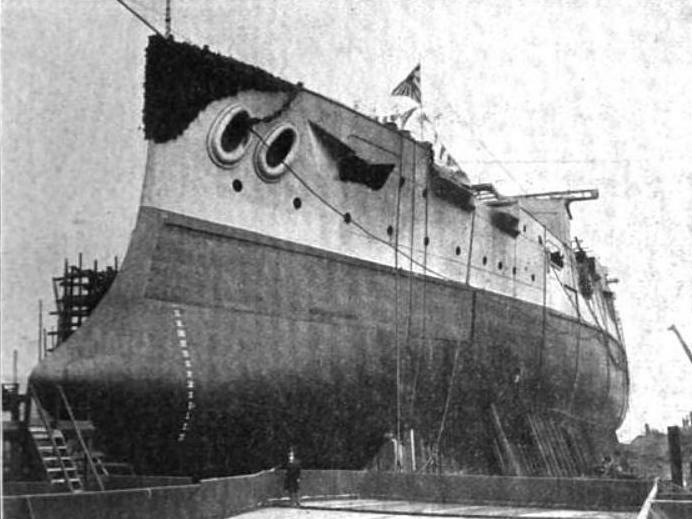 She was completed in 1900. She was virtually an improved copy of Shikishima. Trials quickly showed problems with the boilers, consuming coal at an abnormally high rate. This defect was rectified, and she participated in the Russo-Japanese war, blown up by a mine on October 26, 1904. But she survived thanks to the crew’s effort, was towed out of harm and later repaired in time to take part in the battle of Tsushima, being hit several times during the duels. She was demoted to the reserve and training units in 1914 and was disarmed in 1923. However, she was converted in Kure as a submarine rescue ship and was still in service until 1938. She was later reactivated as a workshop ship, sent in Indochina, to be torpedoed and sunk by USS Salmon in 1942 off the coast, one of the oldest ship ever deployed by the IJN in these waters. -Propulsion: 2 propellers, 4 cylinders, 15,000 hp. and 18 knots. 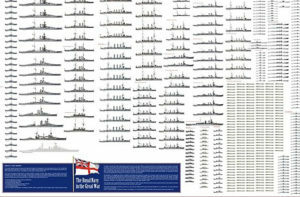 -Armament: 4 x 305 mm, 14 x 152 mm, 20 x 76 mm, 6 x 47 mm, 6 x 45 mm, 4 x 457mm TT sub broadsides. Do you like the Japanese Navy ? 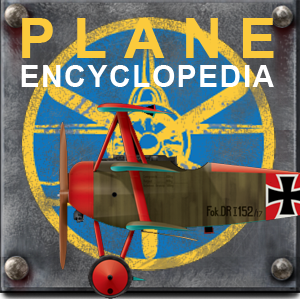 Help Naval Encyclopedia to grow ! Japanese WW1 battleships HD colorized by Hirootko jr.